What happens when you fill your house with smart devices? Just how bad is it to have your house filled with smart devices? Kash Hill attempted to find out by connecting many of them up in her house and then track all the data that they sent out. The results are fascinating. Some of them send the data out in the clear, which is terrible. But even the ones that encrypt your data and leaking things about you via metadata. Essentially whatever value smart devices provide — and some of that value is doubtful — they are monitoring equipment that you set up yourself. Just how much they monitor can be seen here in her study: The House That Spied on Me. It’s a great read, and for some, it will be a great revelation. Image via Home Depot’s web site. Is not what you might think. Some are the same, such as the casualties list. But the diseases show their age. (Who dies of an itch?) Fascinating how people saw illness in the 18th century (not that long ago). 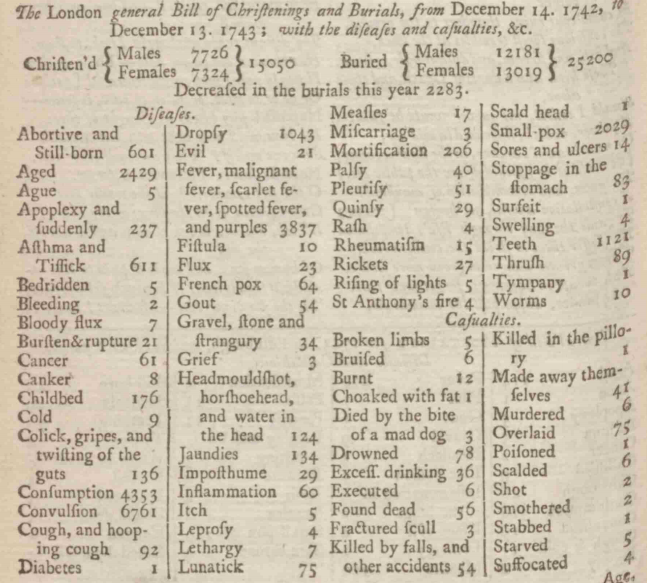 The chart is via Naomi Clifford | Bill of Mortality 1743. You can get more details on it at the link.